There is a large range of badges that can be earned while being a Cub Scout. When you make your Promise you can start wearing the Cub uniform and you will then receive badges to show that you are part of Tiverton District in Devon County, a 1st Hemyock Name Tape and the Purple World Membership Badge. There is over 30 different badges that you can have a go at. Some of these badges are done with the pack during the evenings but others can be done by yourself. You just need to speak to a leader and ask if you can try that badge. Details of what you have to do for each badge can be found here. Gaining a challenge badge involves accomplishing more ambitious tasks within the Pack or community. There are several challenge badges across a number of themes, from the physical and outdoorsy to challenges dealing with the local community or issues connected with the Scouting world. These are usually done within the pack.. Although you can see them here. 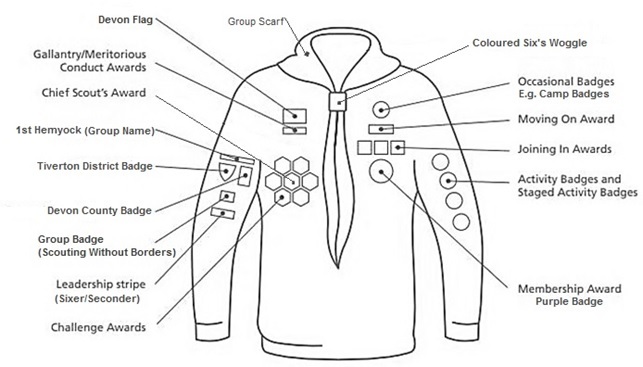 There are six staged activity badges and these can be achieved in all scouting sections. They are staged so you can do the badge which is most appropriate to your level. These badges can be moved onto your new uniform when you go up to scouts. Look at them here. Each of the badges go on your uniform, here is where they should go!